Of course the USA is one country from a technical perspective. Yet from a geographic-based ideological perspective, it’s hard to come to that same conclusion. The results of the 2016 presidential election have only reinforced regional differences. 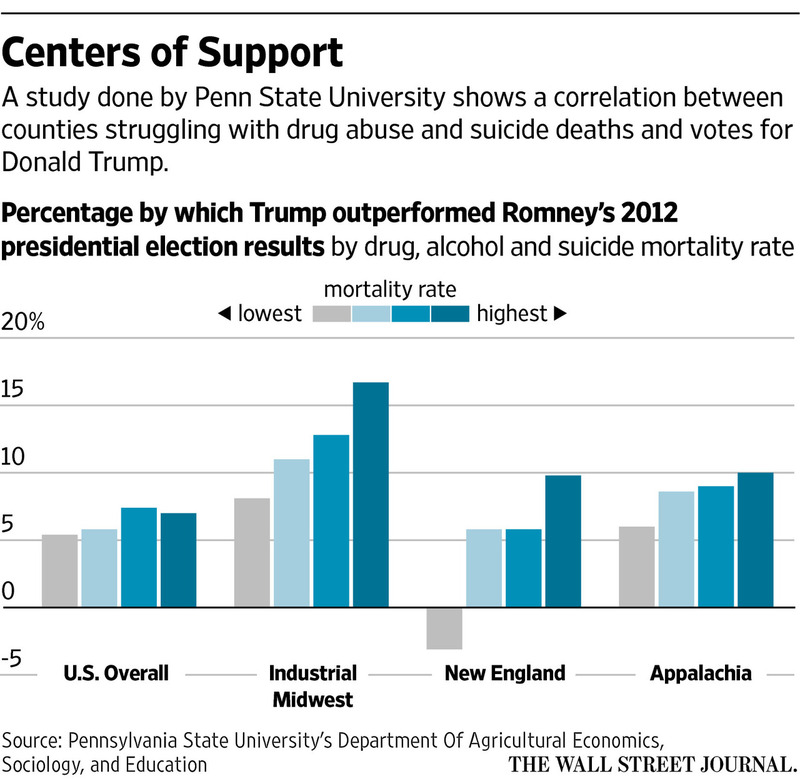 It’s not so much a liberal-conservative divide but an urban-rural one. Judging from the attitudes of Washington insiders, things aren’t a simple Democrat-Republican divide. Prominent politicians of both parties often have similar ideals and goals. What’s troubling is the lack of communication and understanding between urban and rural voters. It’s led to continuous anger at The Other Side. Many liberals, confined to their “coastal citadels,” don’t venture outside of their bubbles. The same is true of many conservatives. For example, you won’t see many farmers or coal miners on a liberal arts college campus. What does an upper middle class Millennial college student from Los Angeles have in common with a 55-year-old lumberjack from West Virginia who saw a neighbor die of a heroin overdose last week? Not much, and neither group seems interested in talking to the other. The city-dwellers call the rural people “backwards rednecks.” The countryside-dwellers call the urban people “entitled smug idiots.” If you don’t interact with certain groups, they can become stereotypes – instead of individuals with unique hopes and fears. 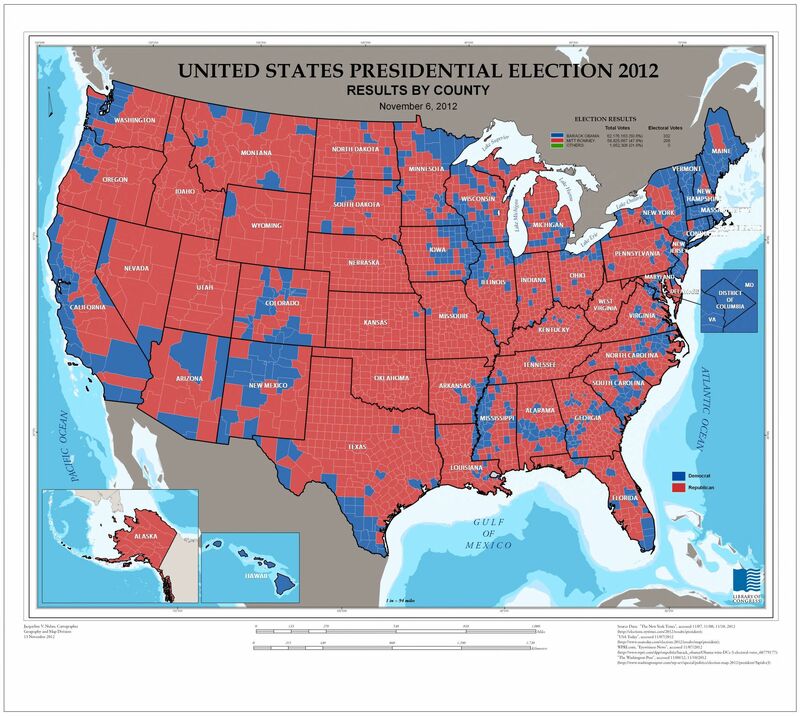 Ideologically, the United States of America isn’t really one country. This idea is implied in the name: The United States. It’s a conglomerate of distinct states which have united under a central federal government. These areas are often likely to lean liberal. 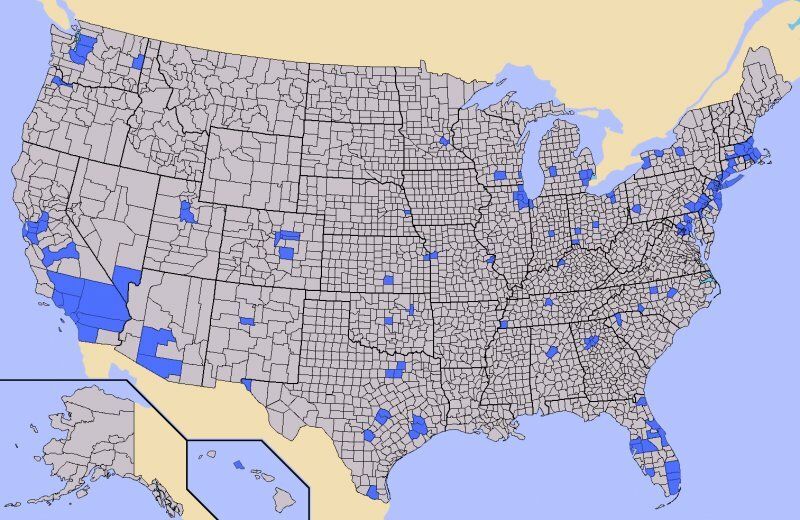 Here’s an example from the 2016 presidential election of how counties voted. It’s not too different from 2012. There appears to be significant physical division among U.S. citizens. It may correlate with ideological and economic differences. Individual bubbles and regional bubbles. Here’s an example of a somewhat region-specific problem: the opioid crisis. It’s a big problem in Appalachia and other areas, with deaths spiking ever-higher. (Although this isn’t a problem confined to the USA.) 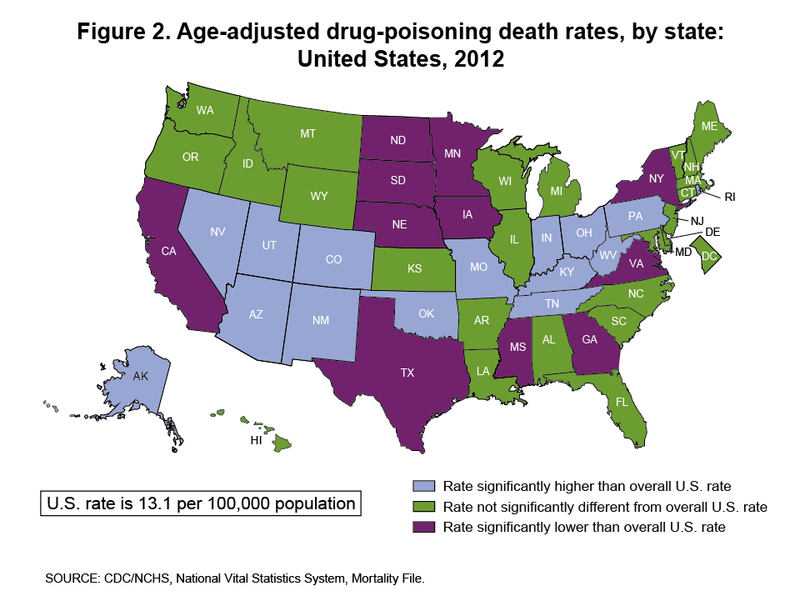 According to the DEA, drugs now kill more people than suicide, homicide, and car crashes. The CDC said “an all-time record 52,404 Americans died from drug overdoses in 2015.” For the people most affected by this, they would’ve voted for anyone who appeared to listen. One common point between low-income people in every region: Severe economic and social obstacles often impede educational progress. College attendance is relatively low for the poor, who don’t see the point of a fancy degree in the face of local devastation. A degree doesn’t help you recover from drug addiction or guarantee a decent job (although it can help). In some areas, a decent job is all but impossible. For many, the American Dream is dead, and they don’t see how upward mobility is possible. Different cultural factors are at play, depending on the region, but the basic idea holds true regardless of urban or rural location. Even in cities, you can find clear divisions between some neighborhoods. Gentrification and a shrinking middle class can contribute to these divides. Cities often get more resources due to the larger population and greater concentration of businesses. For the rural poor, they’re often neglected; left alone in crumbling towns with few jobs or social prospects. There isn’t an easy solution. It’s not a surprise that rates of suicide and drug abuse continue to increase – these people are “dying of despair.” The lack of help and genuine understanding has led them to distrust many groups – the government, the media, and so on. The Republicans, at least, acknowledge their existence; therefore these people tend to vote Republican. There’s a bit of a contradictory mindset here. Many of the rural poor pride themselves on self-reliance, but often enough they don’t have options. You can’t be self-reliant when the only major company in your area moves or collapses, annihilating the local job market. These people are reluctant to move elsewhere. Moving isn’t always easy and they don’t want to abandon their community. Or abandon the homes their ancestors – more often than not – built with their own hands. These people, salt of the earth, don’t have the money or technical expertise for telecommuting either. The lack of an easy solution stems from various factors. Not all is well in the USA. Not many people seem to make an effort to cross the cultural divides which separate many voters. How many Clinton supporters sought out Trump supporters to see WHY that support existed? How many Trump supporters sought out Clinton supporters to understand the other side? Very few, I’d wager. Both groups were content to hurl insults and falsehoods at each other. Some demanded “if you support [candidate I dislike], unfriend me!” Both sides immersed themselves in bubbles of confirmation bias, hallucinating their own distinct realities where Their Side was the correct side. A lack of empathy and/or curiosity was often responsible for the resulting misunderstandings. And both groups were correct in their own ways – it’s just that the issues were often regional. Clinton was a good choice – if you lived in a certain area and were surrounded by certain types of people with certain ideals. These people became convinced that Trump was a temperamental child-like neo-Hitler. Many were more anti-Trump than pro-Clinton. Trump was a good choice – if you lived in a certain area and were surrounded by certain types of people with certain ideals. These people became convinced that Clinton was an untrustworthy uncaring warmonger. Many were more anti-Clinton than pro-Trump. Immersed in the warmth of confirmation bias, people couldn’t see the perceived merits of the other side. That other side – comprised of normal, thinking, feeling human beings – became a twisted evil adversary out to get you. There wasn’t much reaching across the aisle. And thus, each side tended to remain in its own bubble, where Their Side was virtuous and legitimate criticism didn’t exist. An interesting point to consider: facts and policies didn’t matter in this election. Only emotions did. Think about it – were you a Clinton supporter or Trump supporter? How did you come to that conclusion? Most people didn’t ascribe to a view based on pure logic (one where they sat down to compare policy details and professional backgrounds). People didn’t really cast their vote based on facts. They based core decisions on how they felt about the candidates. Each candidate was inspirational to at least one person. It was a shock to many Democrats when Trump won the presidential election. When the liberal bubble popped, previously (over)confident Democrats found themselves confused and angry, not knowing where to turn or who to blame. Some latched onto insane theories. For many people, their brains literally couldn’t handle the fact that Trump won, because of cognitive dissonance. The brain is a strange thing. It can generate intense hallucinations about how you perceive reality. If liberals interacted with Trump supporters, they wouldn’t have been so surprised by Trump’s victory. This election was complex; few things were black-and-white. For anyone who might feel I’m being harsh toward liberals, this is coming from an insider’s perspective. I attended a liberal college (for an art-related Bachelor’s degree) in a liberal city (Philadelphia) where I first registered to vote (as a Democrat). Most of my friends are liberals. My personal political beliefs are difficult to categorize (I would first say “Centrist”) but I’m still registered to vote as a Democrat. Plus, Trump won; conservative bubbles didn’t pop. Only liberals landed in the magical land of Cognitive Dissonance. Perhaps some establishment Republicans too. But most of them had their bubbles popped earlier in 2016, when Trump won the Republican primary. Everyone should recognize their own bubbles – it’s okay to be in a bubble sometimes, but you can’t live there. Save yourself from future headaches and remember that nothing lasts forever. There’s an excellent essay on Vox titled “The smug style in American liberalism.” It talks about some unpleasant behaviors. It mentions how the Democrats started losing their support among the working class decades ago. (With some alternative theories covered in “How Democrats Killed Their Populist Soul” from liberal magazine The Atlantic.) When the working-class support declined, what happened? Well… not what should have happened. tl;dr As the working class deserted the Democratic party, the Democrats insulted them. This still happens. In 2016, the Democratic Party clearly did NOT want to reconnect with the working class. Information available through Wikileaks showed us that. Clinton put a lot of focus on liberal strongholds and major cities. This translated into a lot of votes in cities (for example, Manhattan gave Clinton +457,000 votes over Trump). It didn’t always translate to states as a whole (for the Electoral College). The Clinton campaign also avoided areas where they were overconfident of victory, including entire states like Wisconsin. This is why Clinton ended up with more of the popular vote than Trump, yet still lost the election. Because to win the presidency, you need to try connecting with Americans from EVERY culture, not just the Americans you want to connect with. See the above maps on population and votes. This ties back to the idea behind my post: The United States of America isn’t really one country. It’s a union of states, each with their own ideology. You need to win the most cultures, not necessarily the most citizens. tl;dr Many people live in bubbles. tl;dr Imagine yourself in the shoes of that Other Side. tl;dr Don’t automatically hate on anyone who disagrees with you. Well, my first conclusion is that this post accidentally turned into a lengthy essay. The average time to read will be 10 minutes. And some things are still left unsaid. But if I could sum up this piece in one word, that word would be EMPATHY. The United States of America is a diverse place with many regional differences. It has people from all walks of life. And for the citizens of this nation: see if you can drum up empathy for outgroups. The grass may not be greener on the other side, but you can look for yourself. Try not to live in a bubble. The world is a big place and it’s helpful to try experiencing as much of it as you can. Try to understand where The Other Side stands, and why. It might give you more peace of mind.